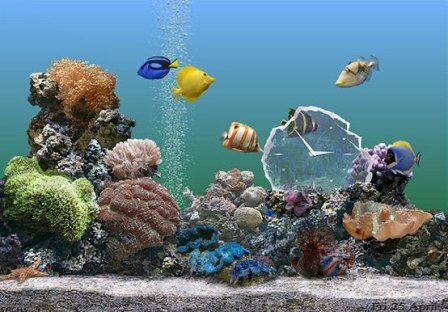 The 3D Marine Aquarium screen saver like shown in the photo below used to fool and con a lot of people into thinking that the computer monitor or LCD screen is actually, an aquarium. 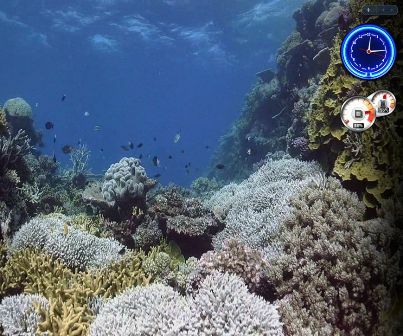 Now in Windows Vista era, not only you can make people into believing that there is an aquatic world in your home or office when computer is not in use or idle, but also you actually do your computing world in marine undersea world, with Aqua Dream Pack for Vista DreamScene. Aqua Dream Pack is a motion desktop video clip that can be set as desktop background with Windows DreamScene in Windows Vista. The Aqua dream movie is based on the theme of undersea paradise. Download Aqua Dream Pack: aqua.zip – 78 MB and supports resolution of 1024 x 768. Screenshot of Aqua DreamScene movie in the work.